Get the information you need when you need it. With the Ing & McKee mobile app and desktop client portal, you can make claims, access your insurance policy and pink cards, or connect directly with your broker to answer any questions you might have. Accessing your insurance information has never been easier with Ing & McKee’s online client portal. When you register online, you can see your policy information, any pink cards you have for home, auto, or your business, and you can request changes to your policy right from your portal. You can make claims, schedule and change your payment information, or contact your broker if you have any questions. If you need to access your insurance information, the last thing you want to do is have to search for it. Never leave home without your insurance when you download the Ing & McKee app for your smartphone. The Ing & McKee app gives you secure access to all your insurance information, including your pink cards. 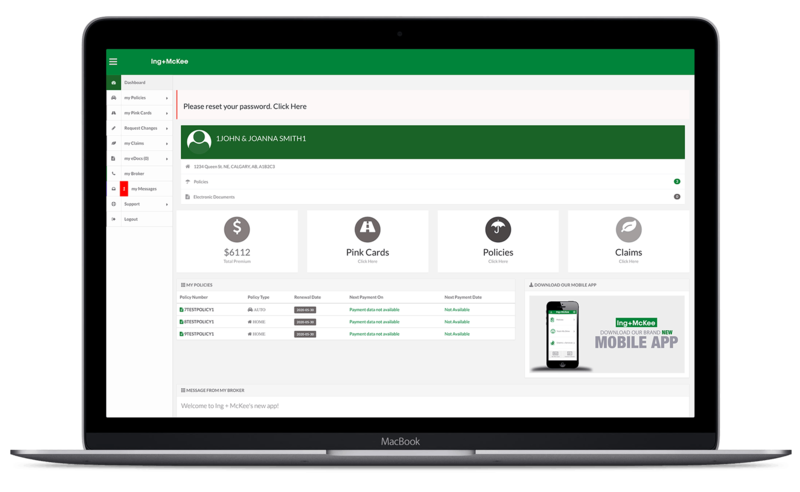 Life happens, and with the mobile app, you can easily file a claim straight to your insurance broker without having to call them. This intuitive feature allows you to recreate an accident and upload pictures to help your broker process your claim. Using smart location targeting, the app also provides phone numbers for car repair, autobody shops, rental locations, gas stations, hotels, taxis, and locksmiths based on your location – which means you’re never stuck wondering what you should do next.